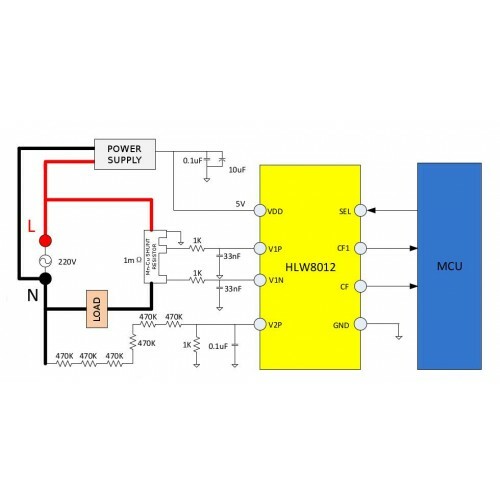 The HLW8012 is a single phase energy meter IC from HLW Technology. 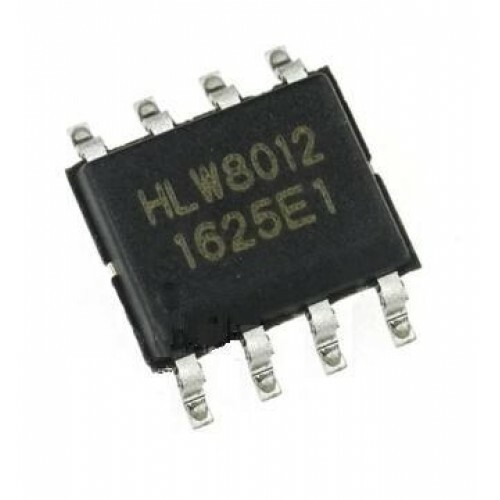 HLW 8012 is a single-phase multi-function metering chip that provides high-frequency pulse CF for energy metering and high-frequency CF1 for indicating current Valid value or voltage rms value. 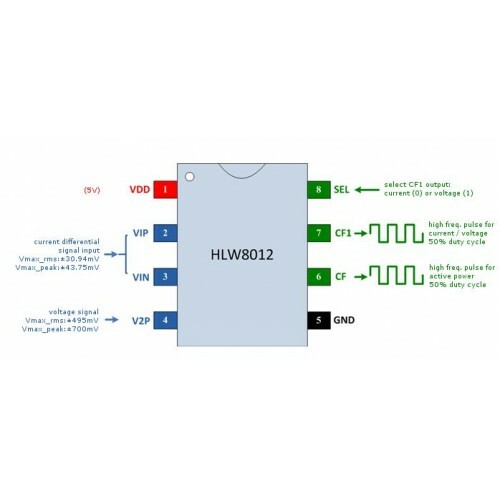 The HWL 8012 is a 5 Volt IC that monitors both voltage and current and output RMS voltage, current and active power encoded as a 50% duty cycle square wave where the frequency is proportional to the magnitude. Current is measured by a differential potential measure across a milli-ohm copper-manganese resistor in series with the main current flow. The differential potential is fed into pins VIP and VIN. The resistor must be such than the wave in VIP-VIN peaks at 43.75mV maximum. A 1milliohm resistor is well suited to measure currents up to ~30A with a dissipation of less than 1W. Voltage is measured in the same way but since the V2P pin supports up to 495mV RMS signals the potential has to be scaled down. The HLW8012 recommends a voltage divider of 6 470kOhm resitors upstream and a 1kOhm resistor down stream. On the MCU side of the IC we have two pins that output the square wave. The CF pin pulse frequency increases as the active power increases too. The relation depends on the reference voltage (2.43V), the internal clock frequency (3579kHz typically), the voltage divider in the V2P input and the milliohm resistor. The CF1 pulse is proportional to the RMS current or voltage, depending on the value in the SEL pin. If SEL is pulled high then the CF1 pin outputs a square wave with a frequency proportional to the RMS current measured. If SEL is pulled down it will ouput the RMS voltage instead. Nominal values are 15mA or 0.5 Volt for a 1Hz wave.